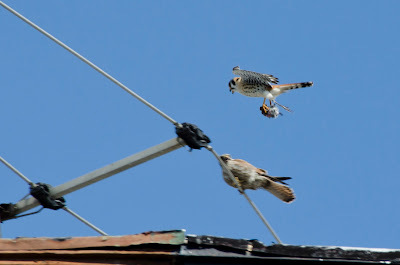 The American Kestrel is North America's smallest falcon. They are common in New York City. Despite being only about the size of a robin, they are deadly predators that swoop from the sky to seize insects, rodents, and small birds. 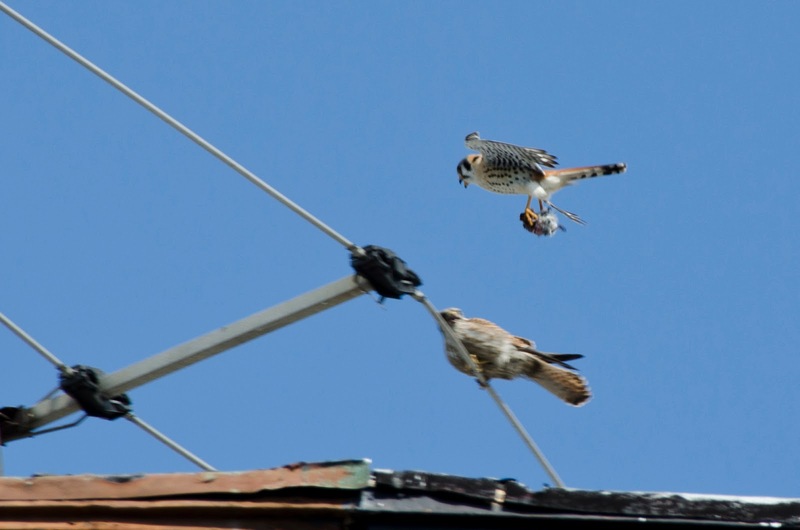 It is not unusual to see a kestrel with a mouse dangling from its talons flying over a New York City street. The other day I was walking in Brooklyn when I heard urgent sounding calls of klee klee klee from above. 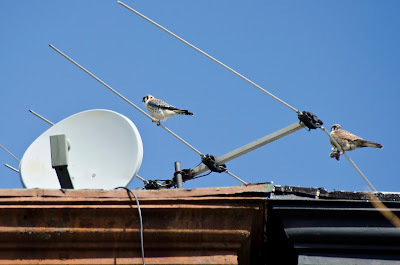 Two kestrels were flying over the buildings, a male and a female. Male kestrels have slate blue wings with rusty backs and tails. Females have reddish brown wings, backs, and tails, with no blue. Both sexes are pale below and have vertical black bars on the sides of their pale faces. The birds I saw were making a commotion, darting and calling -- and the male was carrying something. The female landed on an antennae on the roof of a Brooklyn brownstone. The male landed nearby. He had a small bird in his talons! Captured prey! In what I think was an incidence of courtship feeding and with lots of wing flapping, the male passed the prey to the female and then took a seat again while the female tore into her nuptial meal. Sorry I could not get closer for details with the camera I had with me, but you'll get the idea from below. Click on the photos to enlarge. The pics and commentary are perfect.